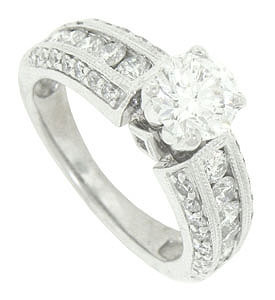 This 14K white gold antique style engagement ring is set with a dazzling .78 carat, F color, Si1 clarity round diamond. 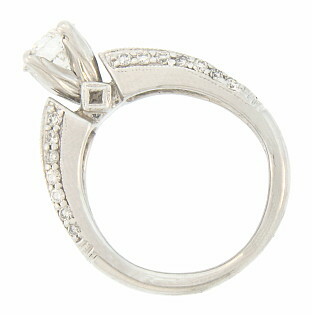 The rings' shoulders are draped with round diamonds framed in milgrain and bordered by two rows of smaller diamonds. In addition to the center stone, the mounting holds .75 carat total weight of round diamonds. The wedding ring measures 5.56 mm in width. Size 4 3/4. We can re-size.